Northwestern University is a consistently ranked top-tier university that draws both national and international students. For TeamWorks engagement, Northwestern’s communication goals were to showcase their multidisciplinary approach to education and a campus life that intersects students across disciplines all the time. We were tasked with compellingly delivering these narratives to prospective students and parents in the Evanston Campus’ Segal Visitors Center. We evaluated, designed and built out the entire prospective student visit, from the website virtual tour through the on-campus visit, from the moment they arrive in the center through the presentation, to the tour discussion. We handled spatial strategy, design management, implementation, installation, q/a, tour guide training, and bringing the brand narrative to life via 200 emotionally engaging pieces of written and video content. We created a showcase for Northwestern’s unique, relevant value by serving both our prospects’ needs and natural inclination toward technology. In doing so, we satisfied the interest of both our client and the school’s incoming students. We created 200 pieces of original digital content (160 written, 40 video) to live on a 23-foot-long interactive wall. Narratives reflected the breadth and depth of Northwestern’s rich community of students, faculty and alumni. These stories were also purposefully selected and crafted to make prospects feel they could fit in the Northwestern community and life on campus. 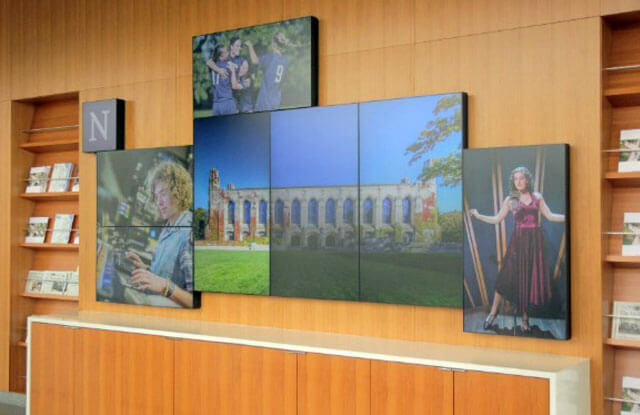 We redesigned the auditorium presentation, adding visual excitement and emotionally compelling narratives, including two segments of video that showcase the personalities of the students and young alumni. We built a 12-minute video loop that was originally scoped to play in the Visitor Center but will now also be used on other campus sites and in recruiting offices around the country because the client was so excited by the work. 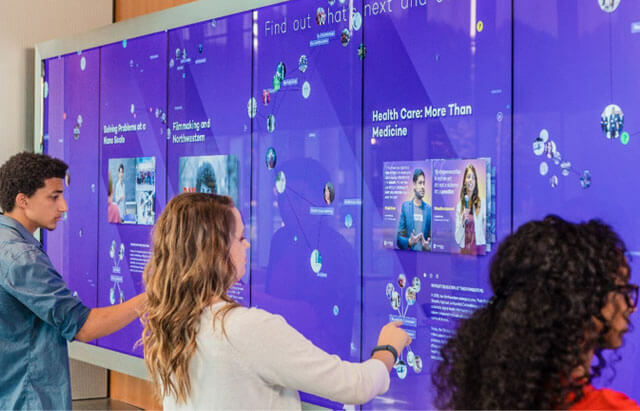 Each year, 62,000 students and parents walk through the state-of-the-art Northwestern Visitor’s Center and immediately connect with the university’s brand story. Rather than get pulled into their phone, 10-150 people at a time are now pulled into a comprehensive experience of campus life through personal stories in multiple digital interactive touchpoints. TeamWorks Media exceeded all expectations at every step and they delivered on time and budget. To learn about how we can help transform your school’s visitor center, get in touch with Katie [at] TeamWorksMedia.com.